Breakfast somehow seems to be so much better during the winter months for some reason. We are occasionally inspired to serve breakfast for supper in the winter as well. 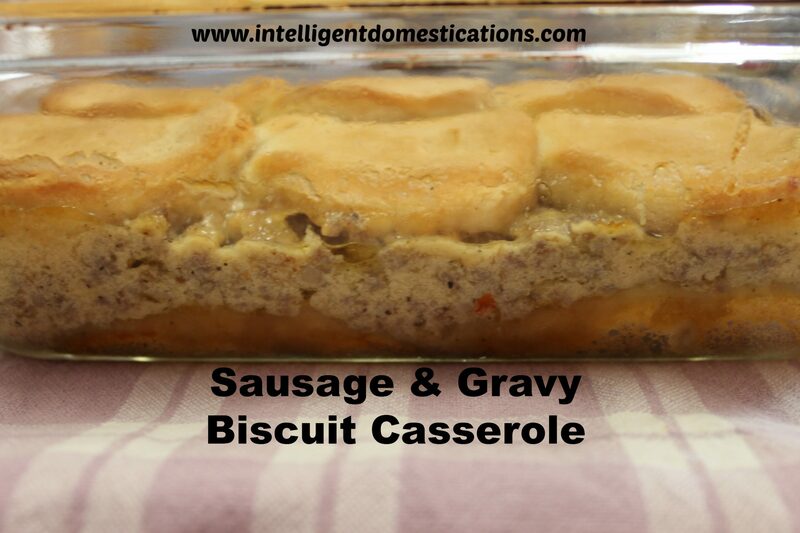 This Sausage & Gravy Biscuit Casserole is great for both and also for a nice breakfast when you have guest! It is super easy to make! My inspiration for this recipe came from the Feb. 2014 issue of Southern Living. You can view their recipe online here. They used jumbo biscuits. I chose store brand regular biscuits because I felt like the jumbo’s would be too much bread for my preference. They made the gravy from scratch. 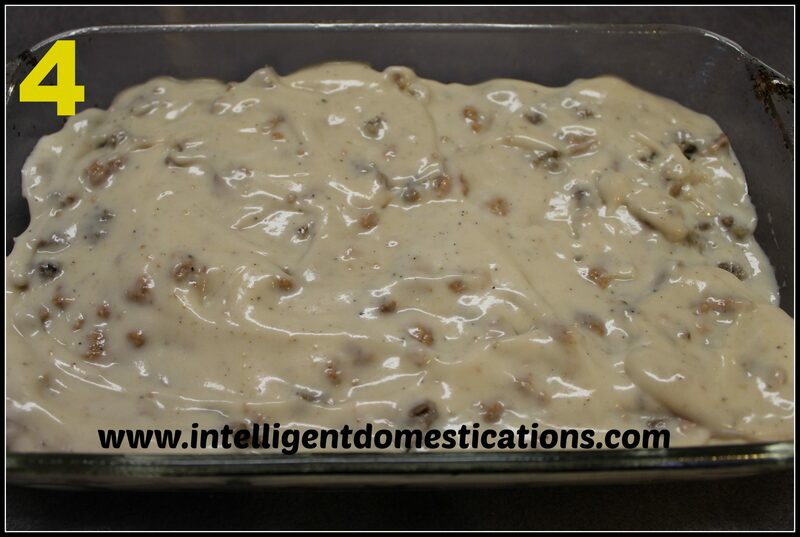 I did that the first time but have since been using Campbell’s Country Style Sausage Gravy. I flattened out the biscuits on the bottom layer. They used green onions, I did not. This dish is super easy to make! As with most casseroles you can add most any ingredient which your family may love such as the onions or mushrooms, whatever you choose. What is your family’s favorite ‘extra’ ingredient for casseroles? Spray your dish with non-stick spray. 1. Cook and drain the sausage. 2. 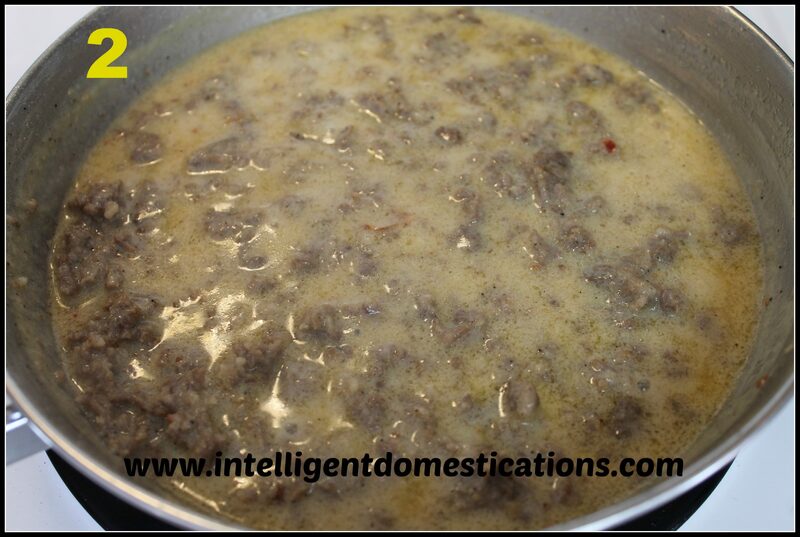 Add drained sausage back into skillet and pour in the gravy. Heat through. 3. 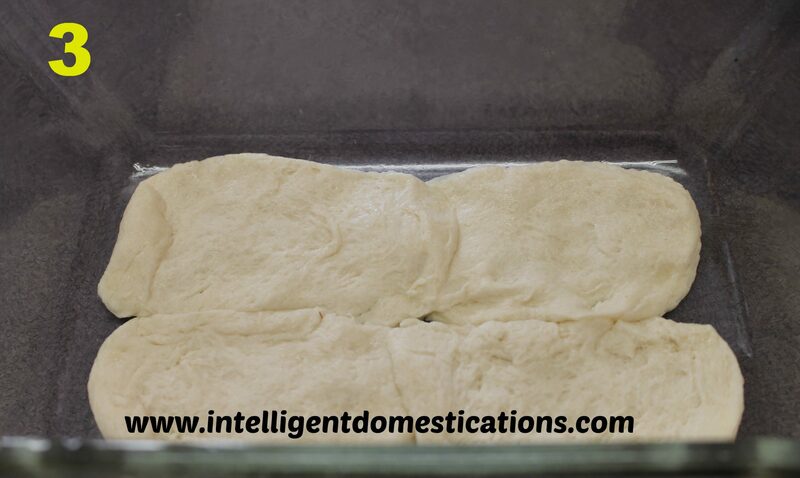 Create a bottom layer by placing biscuits on the bottom. I flattened and stretched my bottom layer as seen. 4. Pour the hot sausage gravy mixture on top of the biscuits. 5. Top the sausage gravy mixture with the cheese and then the remaining biscuits. 6. 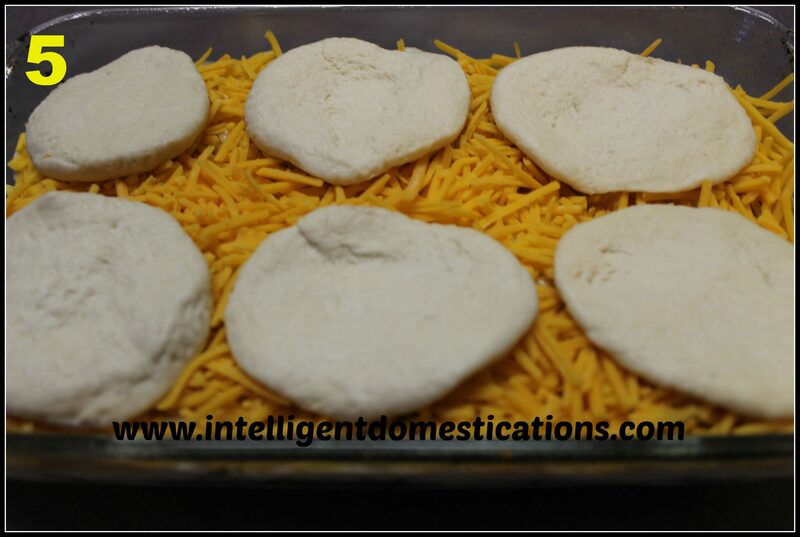 Bake at 350 degrees until biscuits are browned and cheese has melted. Follow cooking time on the canned biscuits. Do you ever make breakfast for supper? Wow that looks great. I bet the kids would love it! Thanks for sharing! Breakfast is my favorite meal of the day. I don’t get it very often but I do love it. This casserole looks yummy. I have to admit I’m not a biscuit and gravy kind of girl but I’m trying to figure out if there would be a way I could tweak it so that I didn’t have to do the gravy part. Something about the gravy part that makes me think….soggy bread. It probably isn’t at all….I’m just weird. Thanks for stopping by Cindy. I will go check out your chocolate-banana-oat pancakes! Yum, yum and yum. I love sausage, biscuits and gravy! I will definitely be trying this! HI Echo, glad you liked the recipe! Thanks for stopping by. It really is as good as it sounds and looks! 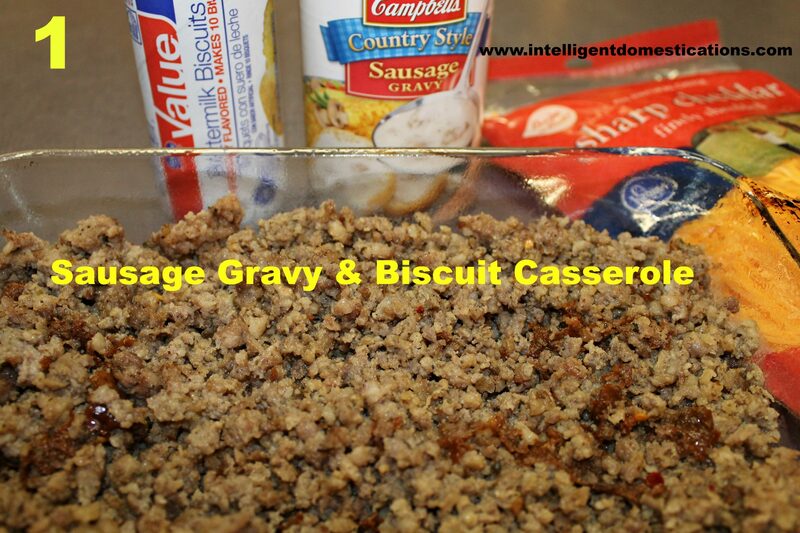 Sausage, gravy and biscuits, a winning combination! I make breakfast for supper all the time! I love it. It’s quick, easy and usually cheaper too. This recipe looks really good. I like Libby’s canned gravy, but I’d do real biscuits. I just can’t do canned. LOL! What a snob I am huh! LOL 🙂 My hubby loves them, but I don’t. Amanda, I am impressed with you talented cooks who can make biscuits. I am not one of them. There are several brands of canned gravy that are good. A really long time ago, my Mom used to buy a brand called Beverly but I can’t find that now. We do make breakfast for supper regularly, maybe because we have such long winters ;). Sausage and biscuits all in once sound yummy! I’ve almost talked myself into making breakfast for supper today! Yes, this is really easy to make. Hope you give it a try! Wow. This recipe looks both easy and delicious. We have breakfast for dinner about once a month. When we do, I usually make gluten free pancakes, bacon, and scrambled eggs. This will definitely be something I give a shot–although I will have to make the biscuits from scratch…gluten free! This looks delicious – and easy! Thanks for sharing your recipe. My family will love this! Thanks for stopping by, Kim. I hope your family does enjoy this recipe, it is super easy and so yummy! SL cut up their biscuits in their version, my inspiration. I liked the whole because it made a better ‘crust’ on the bottom and they run together on the top and create little individual ‘biscuits’. Oh, gosh, that looks good, Shirley! Every time the grands spend a Friday night with us (usually a couple of times a month) they always want sausage, gravy and biscuits for breakfast. And I think this casserole will be a big hit with them! Breakfast for supper is one of my favorite meals! I’m pinning! Alli, the Grands know where to get a good breakfast, don’t they!